The Model S P100D will now have an EPA-estimated 315 miles of range, an increase of 45 miles over the P90D. 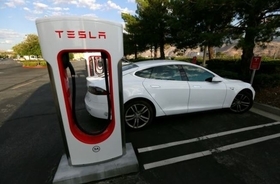 LOS ANGELES -- Tesla is giving its fans another thing to get charged up about with the introduction of a 100-kilowatt-hour battery pack for both the Model S sedan and Model X crossover. The models equipped with the new higher-capacity battery will sit at the top of the S and X model lines and promise greater range than the 90 kWh packs, which will stay in production. The Model S P100D will now have an EPA-estimated 315 miles (507 km) of range, an increase of 45 miles over the P90D and a critical leap over the 300-mile range threshold. Tesla claims the Model S P100D -- when equipped with the optional Ludicrous model -- will be able to do a 0-60 mph (97 kph) run in 2.5 seconds and 0-100 mph in 2.7 seconds. The Model X P100D will gain an extra 39 miles of EPA-estimated range for a total of 289 miles. This crossover will do 0 to 60 mph in 2.9 seconds with Ludicrous mode and 0-100 mph in 3.1 seconds, according to Tesla. Due to the challenges of manufacturing the new, denser battery packs, Tesla will limit production of the P100D models initially. Currently, Tesla hopes to make around 200 of the 100 kWh packs a week or around 10 to 12 percent of its overall battery pack production. The availability of lower-cost Tesla models with the new packs (but without the P performance element or the Ludicrous mode upgrade) will depend on consumer demand for these initial P100D models. “I think it will probably be several months before we can offer the 100 kWh pack to non-Performance customers,” Musk said, citing the need to ramp up production gradually as Tesla irons out issues in the automation process. Technologies on the new 100 kWh battery pack will also wind up in the forthcoming -- and cheaper -- Model 3 sedan. “Some of the key improvements that enable this are directly on the roadmap toward the technologies that make the model 3 possible,” JB Straubel, Tesla’s chief technical officer, said during the call. Fans who have ordered but not yet taken delivery of a Model S or X P90D with Ludicrous mode can upgrade to the 100 kWh pack for an additional $10,000. That puts the price of the new Model S P100D with Ludicrous mode at $134,000 and the Model X P100D with Ludicrous at $141,000 including delivery but before any options are added or tax incentives are deducted. Existing owners of a P90D with Ludicrous mode will be able to upgrade to the higher-capacity battery pack for $20,000, a conversion that requires a new physical battery pack rather than merely a software upgrade. The possibility of the more powerful battery pack was first floated in March by a hacker who discovered a reference to the P100D model in the code of his personal Model S.
Several weeks ago, reports in the Dutch press said the government regulator in the Netherlands that Tesla uses to approve its vehicles for European roads had approved a 100 kWh battery pack.